Spero Karas (in blue coat), orthopaedic surgeon at the Emory Sports Medicine Center, has been head team physician for the Atlanta Falcons since 2011. As the Atlanta Falcons head to the Super Bowl in Houston on Feb. 5, Emory Healthcare physicians in sports medicine, cardiology and ophthalmology will be on the sidelines to provide team support. Emory physicians have provided a variety of medical support to the Falcons throughout many seasons. Emory Sports Medicine Center physicians Spero Karas, Jeffrey Webb and Brandon Mines will travel to Houston with the team to help keep players injury free and healthy during the biggest game of the season. Several other Emory Healthcare physicians have provided preseason screenings and ongoing diagnosis and treatment for the team. Spero Karas, MD, orthopaedic surgeon at the Emory Sports Medicine Center, was named head team physician for the Atlanta Falcons in 2011. Karas serves as the team orthopaedic surgeon, providing sideline support and overseeing the orthopaedic and medical care for both the Falcons’ athletes and coaches. 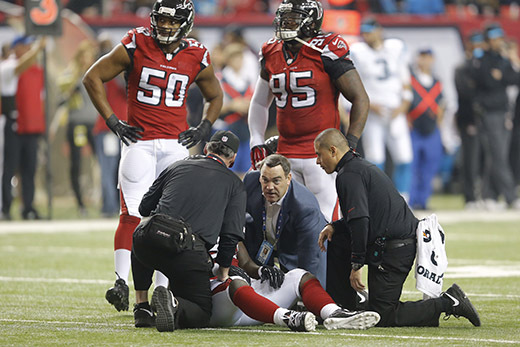 Jeffrey Webb, MD, a sports medicine primary care specialist at the Emory Sports Medicine Center, serves as an Atlanta Falcons sports medicine and concussion specialist and works hard to get players "back in the game" safely and as quickly as possible. He is board certified in pediatrics and sports medicine and provides sidelines medical assistance for the team. Brandon Mines, MD, sports medicine physician at the Emory Sports Medicine Center is also a team physician for the Atlanta Falcons, providing sideline care and operating as their primary care sports medicine and concussion specialist. His clinical interest involves sports injuries and conditions of the shoulder, elbow, wrist/hand, knee, foot and ankle. He has great interest in educating athletes regarding the prevention of sports injuries. Kyle Hammond, MD, is an orthopedic surgeon at the Emory Sports Medicine Center and associate team physician for the Atlanta Falcons. Hammond has a passion for treating adult and youth sports injuries including but not limited to ACL and other ligament injuries to the knees, shoulder and elbow injuries, and cartilage repair and transplant surgery. "Drs. Mines, Webb, Hammond, myself and the entire medical team are proud of our six-year association with the Falcons and pleased about the role that we have played in keeping our players safe and healthy throughout the seasons," says Karas. "Their health is our priority and we are committed to helping them achieve their goal toward this Super Bowl victory as well as the many other victories to come." Emory Healthcare physicians provide comprehensive healthcare for everyday patients, emerging athletes, and college and professional teams including the Atlanta Falcons. Each season, in addition to head and orthopaedic support, Emory physicians provide team members various health screenings including eye, heart and cardiovascular care. Anastasios Costarides, MD, PhD, is the Pamela Humphrey Firman Professor of Ophthalmology in the section of glaucoma at the Emory Eye Center. He was named the Atlanta Falcons' team ophthalmologist in 2011. He leads the Eye Center team in conducting preseason vision screenings for all the players and manages their eye care issues throughout the year. Dr. Costarides diagnoses and treats diseases, injuries or trauma of the eye. "We at the Emory Eye Center have had a great relationship with the Falcons over the years," Costarides says. "We are excited by their success. Our goal is to optimize their vision and manage their eye care needs." Jonathan Kim, MD, assistant professor in the Division of Cardiology, serves as the head team cardiologist for the Falcons. He joined Emory in 2014 and established Atlanta’s first dedicated sports cardiology practice. Kim’s sports cardiology background ranges from determining the effects of exercise on the heart's structure and function to recent projects evaluating blood pressure changes in football players and heart health among 10k and long distance race runners. Kim provides preseason screenings and medical care for a variety of cardiovascular conditions specific to athletes. "My clinical work focuses on the preventive cardiac care for athletes and highly active individuals as well as guiding the cardiac management of athletes who are diagnosed with cardiovascular disease," explains Kim. "We are proud to provide these types of services and care to the Atlanta Falcons and look forward to doing our part to maintain their health and wellness on the road to the Super Bowl and beyond,"